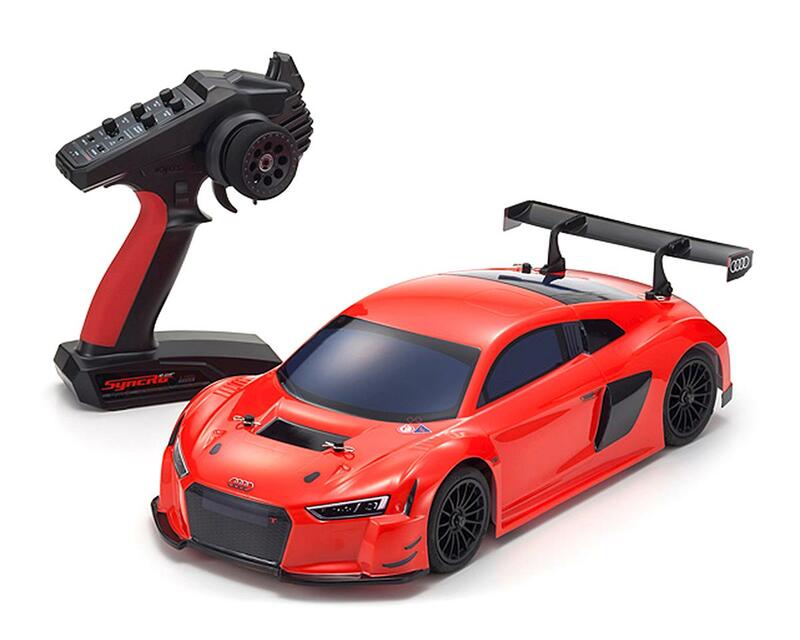 The Kyosho FW06 GP Audi R8 LMS 2015 ReadySet 1/10 Nitro Touring Car offers user-friendly with mild control response, making the FW-06 a great introduction to GP touring cars. 2-speed automatic transmission combines with the high-power KE15SP engine to make full use of the power band and maximize performance from KYOSHO's proven shaft-driven 4WD chassis. With the same rear suspension as the World Champion V-ONE RRR with setting options and maintenance-friendly features only available on the latest racing machines, the FW-06 chassis also meets the demands of expert-level drivers. All this performance is packed into a fully-assembled Readyset. Equipped with the 2.4GHz Syncro KT-231P+ transmitter, finding an open frequency is a problem of the past. In addition to the dual-rate function, the KT-231P+ also features a failsafe function that automatically reduces the throttle if radio signal is interrupted *check setting before first run*. Simply switch the power on and you can be on the track and clocking race-winning times straight away.